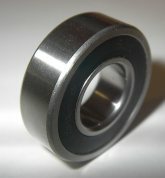 R16 BEARING: 2.00 OD X .500 WIDTH X 1.00 ID BALL BEARING- LOAD RATING: DYNAMIC: 1850LBS. STATIC: 1222LBS. Thank you as always for your very prompt responses – I wish more companies worked like Sunray!